Let’s face it, when it comes to weekend mornings, everyone wants a slow relaxing brunch but no ones wants to be stuck in the kitchen making it. After all, which would you choose – sitting at the table sipping tea and reading the paper or standing over the stove dipping and flipping bread slices for french toast? I think I know which option most of us would choose. Which is why baked french toast makes so much sense. You can let the bread soak overnight and then just pop everything into the oven the next morning. Baked custardy goodness? Why, yes. I’ll definitely take some. Add some blueberries barely simmered in warm maple syrup and breakfast couldn’t be simpler. Thanks goes to Seasons 52 for happily sharing this recipe for their baked brioche french toast. The folks at Seasons 52 definitely know how to do brunch right. They recently hosted me and several other members of the Houston Food Blogger Collective at their Houston-Galleria location where we got to taste this and several other delicious offerings from their brunch menu. We sat at the Chef’s Table which is the private dining room right next to the open kitchen. From the private room, we were able to step out and check out the action in the kitchen and visit with chef James Holets. We started with mimosas and some smoked salmon flatbread, a super thin crispy bread topped with generous amounts of smoked salmon, capers, red onion, fresh lemon zest and horseradish cream. I could have stopped at the smoked salmon flatbread and been perfectly happy but there were still more courses to come. Next up were mini-parfaits of vanilla Greek yogurt and house-made orange marmalade topped with granola. I’m normally not a big fan of Greek yogurt but this was excellent. Entrée choices included shakshuka (eggs baked in a sauce of sweet peppers, tomatoes, chorizo and crumbled feta), braised beef short rib hash topped with poached eggs, and brioche baked french toast with blueberry infused syrup. I went with the braised beef short rib hash because I can’t refuse any offerings of short ribs (ever) and you can never go wrong with potatoes and beef topped with a red wine sauce. The great part about the Seasons 52 menu is that it changes with the seasons so there is always something new to discover. Note: I was invited to attend a tasting at the restaurant as a member of the Houston Food Blogger Collective. All food and drink were provided by Seasons52. As always, all opinions are my own. Thank you for supporting the companies that help make Taming of the Spoon possible. Coat the bottom and sides of a 9×13 inch baking dish with butter. Arrange the slices of bread in the pan (cutting pieces to fit as necessary). Set aside. In a large bowl, beat together the eggs, half & half, honey, vanilla, cinnamon, salt, and orange zest until evenly combined. Pour the egg mixture over the bread slices and let it soak for about 10 minutes. Flip the bread slices over to soak the other side. Press down on the bread slices with a sheet of wax paper or a rubber spatula to help the mixture soak through. Cover the pan and refrigerate overnight. The next morning, heat oven to 350 degrees. Bake the french toast, uncovered, until the bread is slightly puffy and is lightly browned on top, 30-40 minutes. In a small saucepan, bring the maple syrup and fresh blueberries to a simmer and remove from heat immediately. 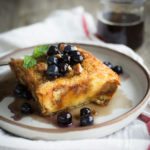 Using a knife, score the French toast in-between slices of bread and serve with blueberry syrup and pecans. Recipe courtesy of Seasons 52.